When you are out looking for the best motorcycle insurance companies, you will need time to narrow down to one. In most cases, people would pick their insurance policies based on their rates. Of course, cheap rates are a good attraction, but they don’t always mean the best. You might not know but your choice of the best motorcycle insurance company depends a lot on the type of motorcycle you have. Yes, some companies are good at insuring custom bikes whereas others carry better policies for sport bikes and so on. Let’s take a look at some of the most well-known motorcycle insurance groups and companies, and see which one is best for you. Nationwide is a well-known name when it comes to motorcycle insurance policies. What brings them to the top of this list is how attractive and useful their policies are. Good policies are not all about affordable premiums and big coverage amounts. In the case of Nationwide, it is the way they design their policies that makes them perfect for motorcycle riders. They can be a perfect pick for custom motorcycle insurance as well. 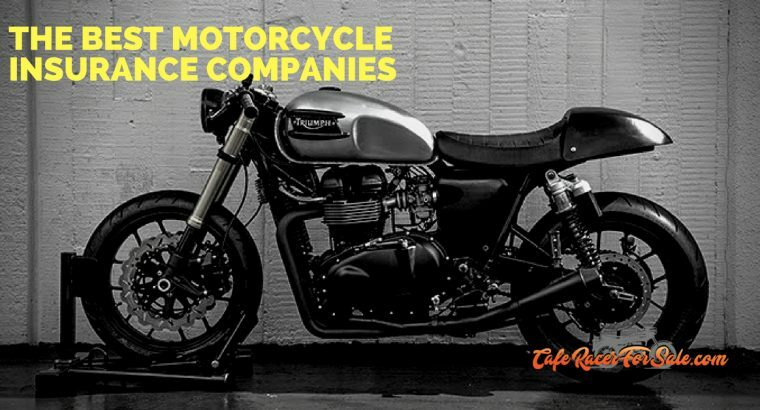 In addition to their basic bodily injury, comprehensive, medical payments, collision coverage, they have some great options for custom motorcycles. Their OEM Endorsement coverage gets you new parts from original equipment manufacturers. In fact, they can just hand over you the money for the new OEM equipment if they can’t find you the part on the market. The free $3,000 coverage for custom equipment is also there with comprehensive insurance. They reward you for being a great rider too in the form of slashing $100 from your deductible every time you spend a year with them without a claim. Overall, they have pretty solid and attractive plans for motorcycle riders. When it comes to Progressive and Nationwide, you don’t need a motorcycle insurance agency to find you the best deals. It is surprising that these two insurance carriers have such great plans despite them being the biggest players of them motorcycle insurance industry. Progressive is almost always up there with Nationwide on every list of best bike insurance companies. What makes Progressive so unique is the variety of its insurance policies. You might not find many other motorcycle insurance companies that have brand new bike total loss coverage, personal belongings coverage, no-depreciation coverage, etc. In short, the many discounts will compel you to get your coverage from Progressive. Geico might a great center of attraction for a lot of motorcycle riders. What separates Geico apart from the rest of the motorcycle insurance companies is its affordability. It won’t be wrong to call them the best motorcycle insurance provider when it comes to inexpensive policies. You might not find the many specialized insurance policies and add-ons that Progressive offers, but that’s not their target. They just want to make motorcycle insurance affordable for their buyers. Their policy customization makes them a perfect choice for riders who want control. If you think you know about insurance policies and can design a good one for you, pick Geico over other carriers. You have to give it to Geico for offering some amazing discounts. A ten percent discount is like a standard discount from them. 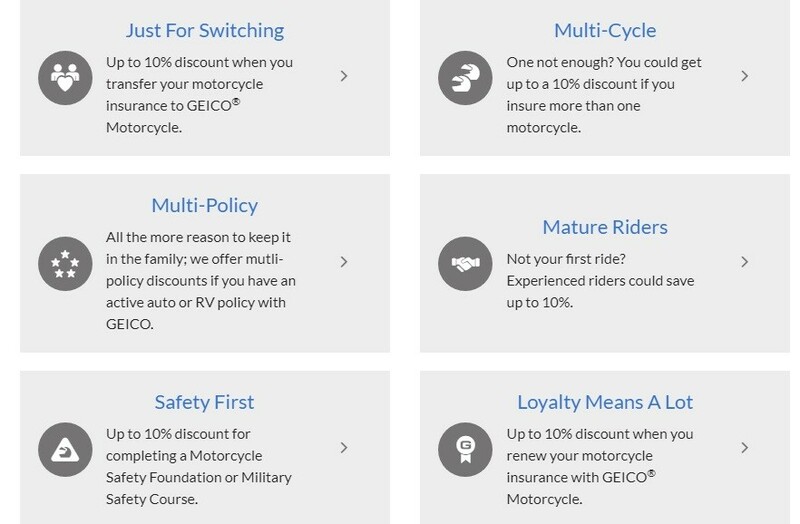 Switching from another carrier to Geico, insuring multiple bikes, renewing your policy, and completing safety courses can give you up to 10% discount each. There is no direct coverage from USAA for your motorcycle. However, their reason for appearing on this list is the benefits they give to people who have served the military. If you have served the military and currently own a motorcycle, there is no better place for you than USAA. As mentioned above, they don’t have their own policies for you. They forward your applications to Progressive. However, the military discounts available to you through USAA are not available if you apply directly with Progressive. They are also great in that they offer financing for motorcycles too. If you already have a motorcycle on finance, you can reschedule your payments by working with USAA. They can help you choose a payment plan that you can easily afford. USAA has a clean mobile application for its users too. Among the options you have read about so far, Nationwide is the best for custom motorcycle insurance policies. However, if there is one company that takes it from Nationwide as well, it is Foremost. Take the example of custom parts for your motorcycle from Foremost. With most other companies, you get $3,000 coverage for the aftermarket parts. Foremost is the only company out of the bunch to make that $3,500. Progressive offers great attraction for motorcycle riders in the form of insurance coverage for safety gear. Foremost takes the cake here too because if covers your motorcycle safety gear with $1,500 coverage. That’s high by $500 compared to other similar insurance policies from the big companies. Moreover, they have total loss coverage of $35,000 to beat their competitors. The might have one of the longest list of types of insurance policies for motorcycle riders. Their waiver of premium surcharge is a great attraction for responsible drivers. Protect your motorcycle with select safety coverage providers and you can get additional coverage of up to $500. These are five of the best motorcycle insurance companies you can find on the internet. They cover almost every aspect of motorcycle insurance from safety gear coverage to custom parts insurance. Their reward programs are great and none of them is what you would call extremely expensive insurance carrier. In the end, it all boils down to you doing a proper research and picking one that suits your specific requirements. Keep in mind that bundling your policies from the same motorcycle insurance provider earns you discounts too.